8min is my comfy pace. Before a race – Sugar Free Red Bull and bananas. Afterwards – Vegetable topped pizza and diet coke. Cooking – I love eating fresh, cooked from scratch foods. I’m mostly a solo runner but group runs help push my speed. I want a sub 3 hr marathon. Also to break into ultra running. There’s no feeling like a runner’s high!! Seriously, running lets me clear my head and enjoy my surroundings. There is nothing that will put me in a better mood than a long run. It’s a wonderful experience. I get to help others meet their goals and while inspiring them to keep running. Plus it is completely fun to soak in the scenery for 26.2 miles without actually racing. 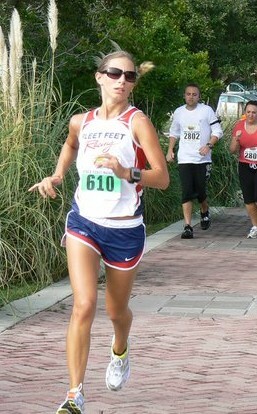 At Palm Beach Marathon, a lady in my group was going for a big PR. While running, she told me what an accomplishment this was for her, since she had completely quit smoking and drinking. She used running to turn her life around! It inspires me to hear others stories of triumphs. I have a lot of energy and beware, its contagious! I will smile and chat the entire 26.2 miles and you will get to the finish on time. I will not walk through water stations, so plan ahead. I will smile and chat the entire time J I suggest leaving the IPOD at home and subject yourself to my infectious optimism. Run with me! Haha. I love to run want you to love it too. So come out and do a race with me! Volunteering at races is great fun and they need the help! A running friend once told me to run with someone faster than myself once a week, then pay it forward by pacing someone slower than me once a week. Not only is it sound training advice, but it feels great to help motivate other runners.